Credit Union President/CEO Gene Foley was surprised at the annual Company Meeting as the entire staff greeted him wearing ties and mustaches, his signature look, in honor of his 35th year at HUECU. 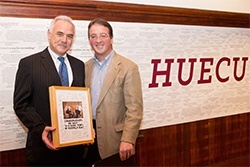 Chairman George White presented Gene with a plaque commemorating the occasion and addressed the group by highlighting Gene’s devotion to helping members, dedication to staff, collaboration with the Board and success in helping to make HUECU one of the strongest and most successful credit unions in the country. Gene’s career at Credit Union started when he was hired as a Teller in 1979. He achieved the top job, following the retirement of long term Credit Union CEO Herb Collins in 1994. During the time that Gene has been CEO, HUECU has grown from $75 million to $500 million in assets and participation has more than doubled to almost 45,000 members. In addition to his work here, Gene is very active in local and national initiatives concerning financial literacy, access to credit and fair housing. He has testified before Congress on behalf of the industry, served in leadership positions for many local and national organizations and has been a contributing Advisory Board member of Banker & Tradesman newspaper. Best of luck for many more successful years to come.